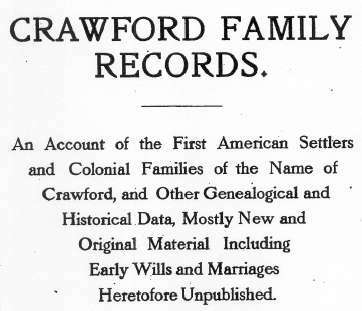 The book, "Crawford Family Records - An Account of the First American Settlers and Colonial Families of the Name of Crawford, and Other Genealogical and Historical Data, Mostly New and Original Material Including Early Wills and Marriages Heretofore Unpublished," by William Clemens, 1914, New York. 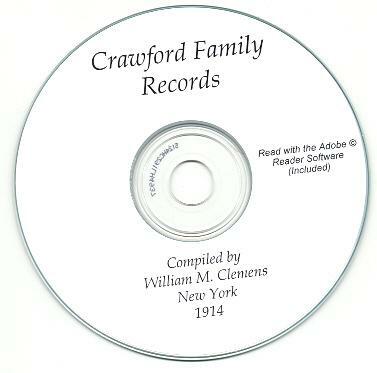 It is filled with genealogy data about various Crawford's and allied families. The book has 30 pages. Please note: This is not a paper book, it is a scan of the original paper book into the digital Adobe PDF format, written on a CD-ROM. You read this book on your computer using the free Adobe Reader software. It is a digital version of a hard to find book. James Allen; John Allen; Rebecca Allen; Andrew Anderson; Ann Anderson; Nelson Anderson; Andrew Annan; & John of Aryshire. Rachel Barclay; James Bell; Margaret Bell; William Bell; Deborah Bickford; Ann Boone; Daniel Boone; Elizabeth Borden; Peter Ter Boss; & James Bourland. 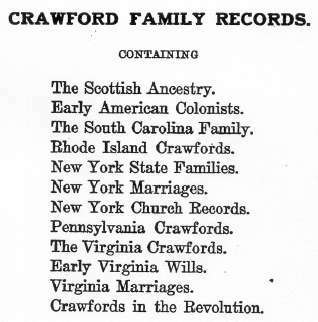 Anne Campbell; Gilbert Campbell; Sarah Carr; James Caskey; James Childers; Agnes Cousar; Alexander Craig; John Craig; Mary Craig; John Cranston; Aaron Crawford; Adirondack Judson Crawford; Alexander Crawford; Alice Crawford; Ann Crawford; Anne Crawford; Arthur Crawford; Asia Crawford; Bailey Crawford; Baxter Crawford; Benjamin Crawford; Bennet A, Crawford; Betsy Crawford; Bettie Crawford; Catherine Crawford; Charles Crawford; Christopher Crawford; Clarinda Crawford; Coe I. Crawford; Daniel Crawford; David Crawford; Deborah Crawford; Douglas Crawford; Edward Crawford; Eleanor Crawford; Eliza Crawford; Elizabeth Crawford; Euphaema Crawford; Ezra Crawford; Fanny Crawford; Freelove Crawford; George Crawford; George W. Crawford; George Washington Crawford; Gideon Crawford; Hannah Crawford; Henderson Crawford; Isabella Crawford; Isabelle Crawford; Jacob Crawford; James Crawford; James E. Crawford; Jane Crawford; Jean Crawford; Jennings Crawford; Jenny Crawford; Jeremiah Crawford; John Crawford; John Gault Crawford; John H. Crawford; Jonathan Crawford; Joel Crawford; Joseph Crawford; Josiah Crawford; Judith Terry Crawford; Kitty Crawford; Lizzie Crawford; Lucy Champness Crawford; Malcom Crawford; Margaret Crawford; Martha Crawford; Martha White Crawford; Martin Jenkins Crawford; Mary Crawford; Mary Cox Crawford; Mary Jane Crawford; Michael Crawford; Moses Crawford; Nancy Crawford; Nathan Crawford; Patrick Crawford; Peggy Crawford; Peter Crawford; Phoebe Crawford; Polly Crawford; Rachel Crawford; Rebecca Crawford; Reginald Crawford; Rhodes Crawford; Robert Crawford; Ruth Crawford; Sally Crawford; Samuel Crawford; Sarah Crawford; Sidney Crawford; Smith Crawford; Steven Crawford; Susanah Crawford; Thomas Crawford; Thomas Hartley Crawford; Uriah Crawford; William Crawford; William H. Crawford; William Harris Crawford; William Thomas Crawford; Kilbrine Crawfords; Johannes de Crawford; Reginald de Crawford; Ronald de Crawford; Alexander Curry; and John Curtis. William R. Davie; Sarah Demilt; James Denniston; John Doby; Isaac Donnom; John Duggen; Samuel Dunlap; & Samuel F. Dunlap. Daniel Falls; Freelove Fenner; & James Fleming. Dominus Galfridus, Lord of Crawford; & Samuel Gillespie. Peter Hanger; Hannah Hare; Alexander Harris; Sophia Harrison; Dearborn Heath; Rachel Henderson; Robert Hogg; Miss Hopkins; Underhill Horton; George Howe; Margaret Holmes; Cyrus Hyde; and John Hyde. William Ingles and Nancy Irvine. Andrew Jackson and Salome Jenkins. Alice Kennedy; Stephen Kibble; & Hugh Kyle. 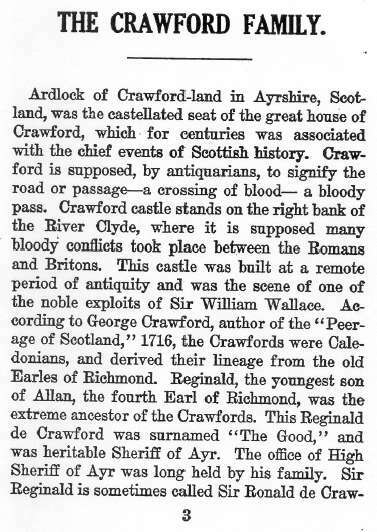 Lanark Family; Elenor Leech; John Leech; Patsy Leech; Thomas Leech; Robert Lewis; Abraham Lincoln; James Lindsay, Earl of Crawford; Abraham Linkhorn; Elizabeth Locke; Joseph Lowrey; & William Lynn. Cordelia Mayer; George McChesney; Mrs McClure; Charles McClung; Cynthia McClung; Harriet McClung; John H. McClung; Samuel McClung; Stuart McClung; Franklin McCue; William McGear; William McNabb; John McNeal; Mary McPheeters; Thomas Mitchel; Harry Miller; Henry Miller; John Miller; Clarence E. Moody; Frederick D. Moody; Howard Moody; John Moody; Edward G. Moorman; and Margaret Morrow. LeRoy Newman; Sally Newman; & Elizabeth Nicely. John Pell; Ann B. Phifer; Martin Phifer Jr.; Mary Phifer; Andrew Pickens; and Sarah Price. Blanche Quiggle; Christian Quiggle; J. W. Quiggle; & John Quiggle. Mary Ratoon; Jane Requa; Allan of Richmond; Reginald of Richmond; Henry Rippetoe; Sally Roaston; Alexander Robinson; Ann Rodes; John Rodes; and Sarah Rowlison. John Sawyers; William Shainer; Henry F. Shoemaker; Elizabeth Smith; Nancy Smith; & Jane Sutton. William Thainon; George Thomas; Henry Teetor; Elizabeth Terrell; William Thompson; and Jenny Todd. James Walker; John Walker; John Wallace; Malcom Wallace; William Wallace; Esther Waterbury; Anna Weir; Amey Whipple; Sarah Whipple; James F. White; Jean White; Sarah White; Thomas White; William White; Thomas Williams; Agnes Wilson; Sally Wilson; Elizabeth Winter; Hannah Winter; Nancy Winter; William Winter; & G. McC Witherspoon.